As a woman who amassed a great personal fortune following her marriages to two of the Gilded Age's wealthiest men, Alva Erskine Smith Vanderbilt Belmont (1853-1933) embodied many of the stereotypes of a social climber, an overly ambitious type bent on crashing the social glass ceilings of New York's Gilded Age society. 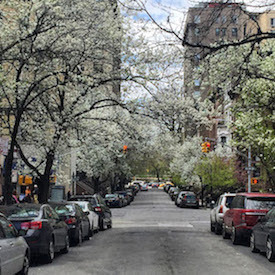 Quite successful in her efforts, her life resembles one of those established and conceited society women in a novel by Edith Wharton or Henry James. Yet, after her second husband, Oliver, died in 1908, Alva's story takes a different turn, although elements of her domineering personality did not. Alva Smith was born January 17, 1853 in Mobile, Alabama to a moderately wealthy family. Before the Civil War, Alva's father moved the family to New York. Like many of her Gilded Age privileged peers, Alva made the grand tour of Europe and summered with her family in Newport. She attended a private boarding school in France. In 1875, Alva made her most advantageous social move when she married William Kissam Vanderbilt, the grandson of railroad tycoon Cornelius Vanderbilt. The fortunate young couple had three children, and Alva kept herself busy ordering around her children and raising the level of their social visibility. After twenty years of marriage, Alva divorced her husband on grounds of adultery. The generous financial settlement, in addition to a few million dollars in cash, included many of their estates. She spent much of her adult life co-designing and commissioning enormous houses, often with Richard Morris Hunt and subsequently with the architect's sons, including the Vanderbilt mansion at 660 Fifth Avenue (demolished) and the Marble Palace in Newport. After the 1895 divorce, at her Newport mansion, she threw one of the era's most lavish parties in honor of the engagement of her beautiful daughter Consuelo to the Duke of Marlborough. Alva planned the whole match, making her unwilling daughter a pawn for her own ambitions. The Duke got two million dollars for his role in this marriage power play. On January 11, 1896, less than a year after obtaining her divorce, Alva married her next-door neighbor and ex-husband's best friend, Oliver Hazard Perry Belmont (1858–1908). Oliver, the son of a Rothschild financier and a racehorse owner (yes, the Belmont Stakes is named for August Belmont, Sr.), became the beneficiary of an enormous inheritance upon his father's death. In addition to Alva's Marble House, inspired by the Petit Trianon at Versailles, and Oliver's own French Renaissance mansion called Belcourt, both in Newport, the couple had yet a third mansion built for them, Brookholt, in East Meadow, Long Island in 1897. While the Newport houses are still extant and are operated as museums, the Brookholt property was demolished in the 1930s. Among the couple's many fine houses is their final resting place in Woodlawn Cemetery in the Bronx. Oliver died on June 10, 1908 after a severe bout of appendicitis, and Alva commissioned the mausoleum as a lasting memorial for both of them. 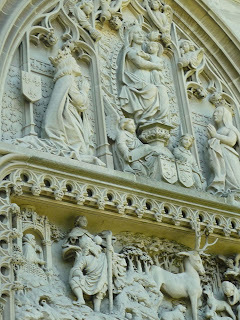 Constructed as a replica of the chapel of Saint-Hubert at Amboise in France's Loire Valley, and notably the burial place of Leonardo da Vinci, the chapel is remarkable in its detail. Like the French original, almost exactly so, the 1910 chapel is abundantly decorated with references to Saint Hubert, the patron saint of hunters. 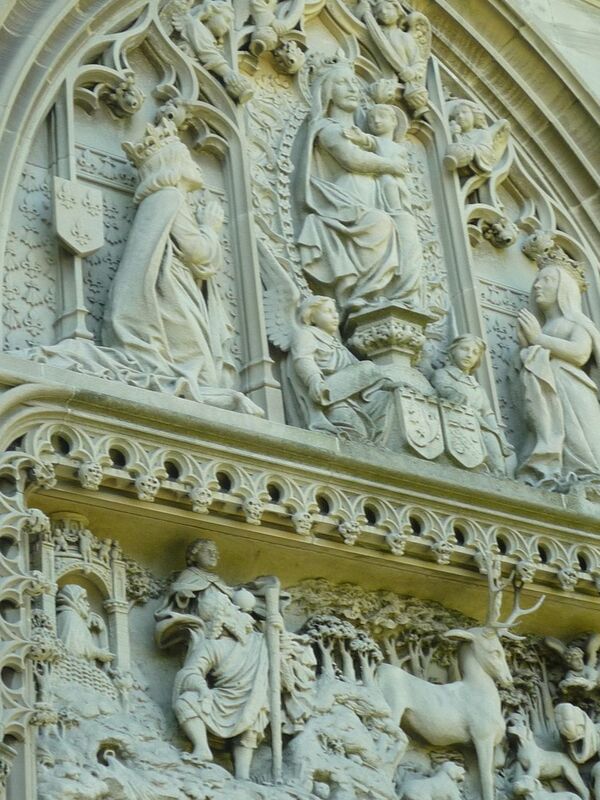 A carving of a stag above the front door serves as the focal point, and the motif of antlers is carried all the way up the steeple. 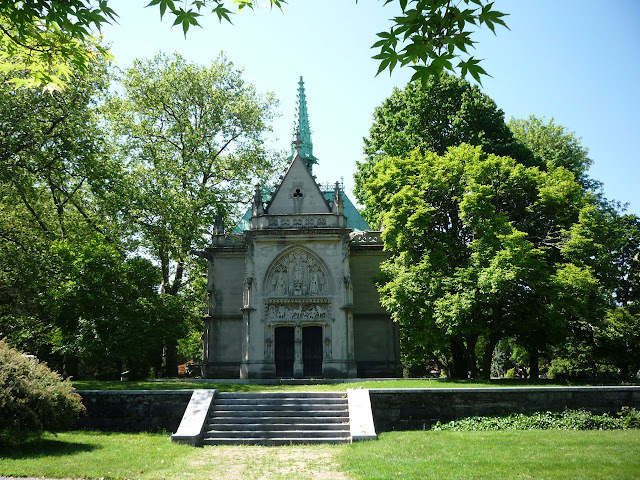 The finest artisans of the day recreated the French chapel for this mausoleum in the Bronx. Alva's funeral at the chapel. flank the entrance to the chapel. After the death of Oliver, Alva became a vigorous leader of labor and women's causes. In 1909 she bankrolled and organized enormous rallies on behalf of the striking shirtwaist workers, and she insisted that labor's plight must be intertwined with the campaign for women's voting rights. 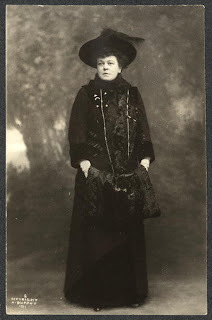 She held feminist organizing sessions at her lavish home in Newport, and she sponsored the 1914 speaking tour of English suffragist Christabel Pankhurst. Alva became an active member of the National Woman Suffrage Association, and she founded the Political Equality League, a local New York suffrage organization. In 1921 she was elected the President of the National Woman's Party. In 1929 she purchased a house in Washington, DC to serve as the organization's headquarters. Now known as the Sewall-Belmont House and Museum, the building on Capitol Hill houses a museum dedicated to the history of women's suffrage and the equal rights movement. For most years of the 1920s until her death in 1933, Alva lived in Paris, maintaining several homes there. She left detailed instructions for her funeral, handing them over to friend and fellow activist Alice Paul to pass on to her New York attorney. When she died, her children accompanied the body to New York for services at St. Thomas Church on Fifth Avenue. As she directed, a guard of two members of the National Woman's Party watched over the body in the chapel at the church where she rested in state for two days. Women's rights activists arrived from all over the country for the Sunday funeral. Feminist honorary pallbearers, carrying purple, white, and gold banners, accompanied the procession of her coffin into the church. The services concluded with the same feminist guard on the steps of the Belmont chapel in Woodlawn. Susan Olsen, Woodlawn Cemetery's historian, met me at the chapel. She pushed open the heavy doors of the chapel, and we walked inside. Oliver is interred on the left side, with Alva on the right, in mirror fashion. 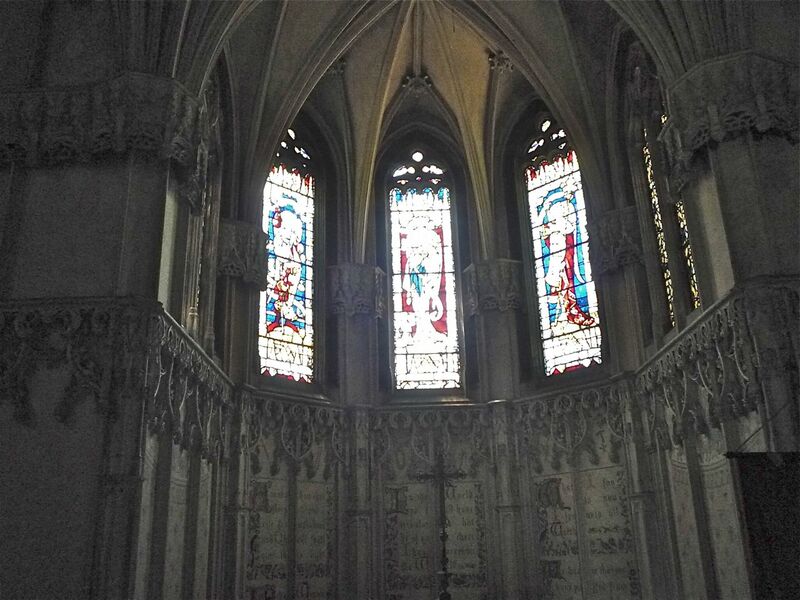 A soft light streams in from the stained glass windows overhead. Olsen pointed out the murals painted by William Mackay, faithful to the medieval style of the French chapel, noting Mackay also created the Ming-inspired murals of the Chinese Tea House at the Marble House. She explained that Alva left detailed instructions for the care of the chapel, and she showed me the chair where Alva's hired caretaker once sat. In 1936, just three years after Alva's death, the Vanderbilt children deeded the chapel over to Woodlawn Cemetery, restricting that there would be no future burials there. Thus, Woodlawn has been responsible since then for maintaining the place, just one of many private mausoleums dotting the leafy streets of the 400 acre cemetery. 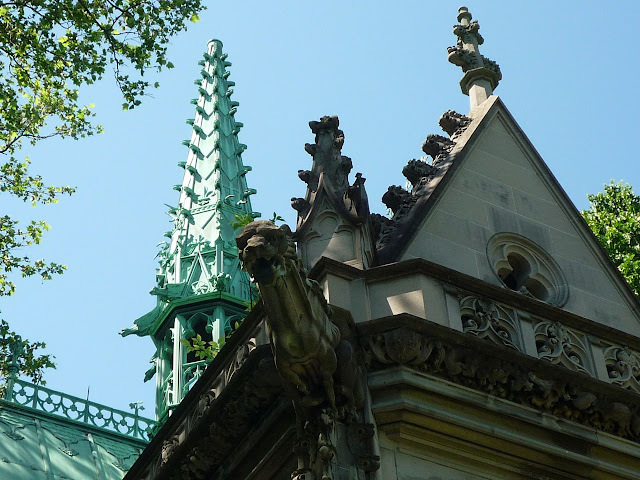 For the Partners in Preservation initiative, Woodlawn is asking funds to restore the exterior of the chapel, now darkened in many spaces due to time, pollution, and the elements. Behind the door of the chapel rests the cross that should be on top of the steeple. It was blown down in a storm a year and a half ago and needs repair. Following Alva's wishes, the cemetery frequently opens the Belmont mausoleum to the public. 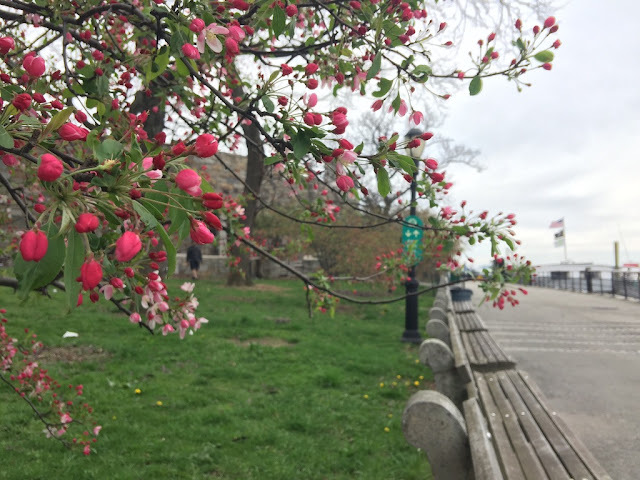 While more visitors these days are expressing interest in Woodlawn and other cemeteries due to the current vogue for genealogy, the expense of caring for our departed relatives frequently falls on the cemetery. Olsen said we should all take interest in maintaining these places as part of our cultural heritage. She says that she likes to begin the conversation with the question, "When was the last time you went to visit your great grandfather's grave?" • Alva E. Belmont. Photographer: Stadler Photographing Co., New York-Chicago. 1911. Records of the National Woman's Party. 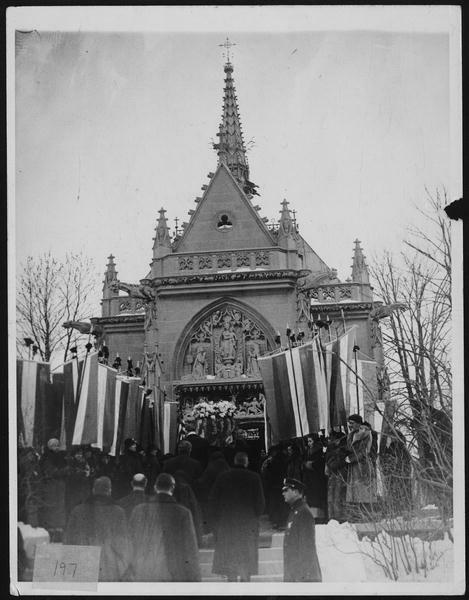 • Alva Belmont's coffin being carried into St. Hubert's Chapel at Woodlawn Cemetery, New York. 1933 Jan. Women of Protest: Photographs from the Records of the National Woman's Party, Manuscript Division, Library of Congress, Washington, D.C. Images of the Belmont Memorial Chapel at Woodlawn Cemetery by Walking Off the Big Apple from May 17, 2012. Thanks to Susan Olsen for sharing the history of the chapel and the work of the Woodlawn Cemetery. Woodlawn Cemetery was one of 40 sites selected in 2012 for the Partners in Preservation initiative in New York City, a program that raises awareness of historic preservation by involving the public in distributing grants.